Turkey is a fascinating country with unparalleled landscapes, important historical cities and popular beach resorts. In Turkey, we visited Istanbul (it was a bit disappointing, if you want to find out why, scroll down to see the articles) and the absolutely amazing region of Cappadocia. Cappadocia is filled with extremely original, unique rock pillars and formations, ancient and modern cave towns - you can book a hotel in a cave - it's totally worth it! 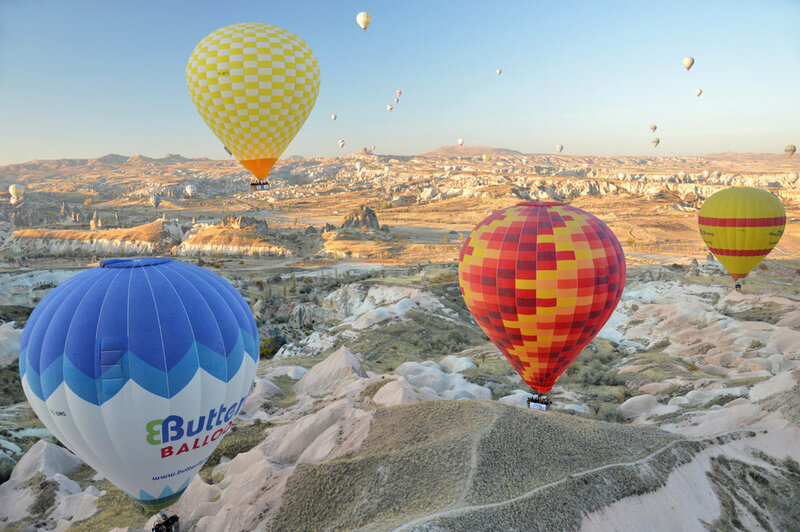 It's also home to one of the most spectacular air balloon flights. Have a look at the posts below to see if it was safe and really worth the (quite high) price! The unique and beautiful region of Cappadocia in Turkey is known for its original rock formations, balloon flights and cave towns where people have lived for millennia. The soft sandstone made it easy for the locals to carve out caves large enough to create their own homes inside. Some of the ancient settlements are located in cliff walls, others in the mountains and some are even composed of a complex network of underground tunnels resembling a termite mound! In this post I'll describe the most spectacular as well as easy to reach ancient cave towns that we visited near Goreme - don't miss them while exploring the region! Some cities are so famous and we expect so much from them that when we finally arrive, after the initial moment of joy, the other, less pleasant phase of disappointment comes over us. Yes, the monuments are stunning, the food is good, the weather is perfect, but there is something missing. And it's hard to explain what. On the other hand, there are places pretty ugly, chaotic or completely unknown - we don't even know what to think - and we fall in love with them. That was the case for me with Tbilisi in Georgia, Prishtina in Kosovo or Kiev in Ukraine - although virtually non existent on the tourist world map, they enchanted me beyond imagination. Istanbul, in turn, was the place I had always dreamed of visiting and in the end, although I enjoyed it, I felt that thing that there's something missing. You will surely find the photos in this post absolutely stunning and you might think that what I say is silly. But I'll try my best to explain my point of view below. Cappadocia is one of the most popular regions of Turkey. The famous all over the world, weird rock formations shaped like mushrooms, pillars and even animals are scattered across the area. Clear weather conditions, crisp even in the late months of fall/autumn allow not only to hike among the most extraordinary valleys but also to enjoy the famous hot air balloon flight, which, although quite expensive, is a one of a kind event that everyone should experience at least once. I visited Goreme in November and I think it was a perfect time. The town was cozy and sleepy, I felt as if I was somewhere at the end of the world and although it is so popular I barely saw any other tourists. Moreover, the leaves that had just turned bright yellow created an excellent contrast with the rock formations making it all look even more eerie and extraordinary. Ihlara Valley lies in one of the most beautiful regions in Turkey, Cappadocia, full of natural rock formations (fairy chimneys) taking the shape of chimneys, mushrooms and sculpture-like forms as if they were carved by man. Although Cappadocia is well known, mostly because of the famous air balloon flights (I've posted photos and described it in detail here), Ihlara Valley seems not as visited by travelers. When I was there, I didn't see any other tourists (which was great!). However, I would like you to encourage you, during your stay in Cappadocia, to see the valley and the gorge as it boasts both historical and natural significance and is somewhat different from the rest of the region.